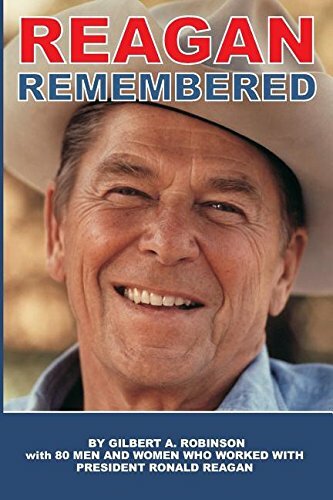 More than 80 men and women appointed by President Ronald Reagan cover topics ranging from his skill in negotiating with the Soviets (and the Democrats) to insider reports of Cabinet meetings and strategy sessions, along with observations of Reagan's unfailing courtesy, consideration for others, loyalty, natural charm, and sense of humor. Also included: selections from key Reagan speeches mentioned in the narratives. Ambassador Gilbert A. Robinson (ret.) is Chairman of a GAR, Inc. an international firm advising Fortune 500 companies on international trade, government relations, and communications. From 1998-2003, he was the National Director and COO of the Center for the Study of the Presidency; from 1983-85, he served as Ambassador and Special Advisor for Public Diplomacy to Secretary of State George Shultz and in February 1981, President Reagan appointed him as Deputy Director of the United States Information Agency, whereby he was confirmed unanimously by the U.S. Senate. In New York City, Ambassador Robinson was Chairman of the Public Relations Board, Inc. In his voluntary job as Chairman of the New York Board of Trade he led the first U.S. Business Delegation to China at the invitation of Premier Deng Xiaoping. Earlier he was the Coordinator of the American National Exhibition in Moscow where he brought together Vice President Richard Nixon and Russian Premier Nikita Khrushchev in the famous "Kitchen Debate." Ambassador Robinson graduated with a B.S. Degree in Economics from Roanoke College, where he recently was awarded the Roanoke College Medal. He is the author of Why I Like Ike, a collection of anecdotes about President Eisenhower and Reagan Remembered.